Luke Marshall’s return to playing after almost a year out with injury would have been perfect for the headlines in Sunday’s and Monday’spapers. The centre crossed for a try to draw Ulster level at 18-18 after 63 minutes in their European Champions Cup quarter-final tie against Leinster in the Aviva Stadium, Dublin. In his last game, against Ospreys last May, he helped guide Ulster into the Champions Cup winning a play-off game to become the last team to qualify for this season’s competition. Coming in as a replacement for Darren Cave in the 62nd minute, Marshall powered his way over for a try a minute later. 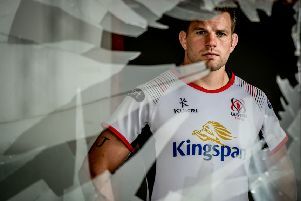 It offered Ulster further hope of a potential shock victory after the defending champions - but it was not to be as Ross Byrne kicked a penalty nine minutes from the end to steer his side into a semi-final meeting against Toulouse back in Dublin later this month. Marshall, delighted to be back playing after suffering the ACL last May, was also deflated at the outcome on Saturday. “It was bittersweet for me today,” he said. Reflecting on his time on the sidelines, Marshall admitted it had been tough at times, particularly watching the big Champions Cup games as Ulster progressed to the last eight for the first time in five years. “To see how far we have come as a squad and being able to watch it from the sidelines, it was difficult because you are itching to get out there,” said Marshall. “There were some great games this year. To beat Racing at home and Scarlets home and away and even some of our league games, beating sides away which we would not have done over the last few years, it shows how much we have grown as a squad. With Ulster’s currently injury profile at number 13, Marshall’s return to the panel will be critical as Ulster now target qualification for next year’s European journey and a play-off in the PRO14. “It is all in our hands now,” said Marshall. “We’ve tough games but good games. “We’ve Edinburgh away and we can put ourselves in a good position if we can win that. “Obviously Glasgow away is tough as well and Leinster again - but they’re winnable.